The first time I ate Thai food was in Montclair, NJ in the early nineties. I clearly remember that the very same week, I headed to Borders, purchased a Thai cookbook, and then to the grocery store, to get some coconut milk, red curry paste and green curry paste. All this effort by a person who is not too crazy about cooking and likes to eat out! The relief of moving to a big city after the confines of a college town where we ate in chain restaurants and drank 99 cent margaritas, had me excited enough to explore all kinds of new cuisines in New York City which was a stone’s throw away. The new cookbook did put me on a path to some rudimentary Thai cooking, consisting of three curries. 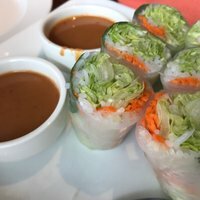 Over the next few years, I had graduated to the more complex rice paper rolls with a peanut sauce dip, while my husband had graduated to making a very good raw papaya salad. For twenty years plus, we enjoyed Thai food in different U.S. cities. No dishes surprised us as being different from what we had come to expect. Then something changed. We moved to Australia and within the first month, we realized something was different about the Thai food there. The freshness, the preparation and taste was almost as if I didn’t know this cuisine before! I was hooked to a new version of Thai food. The enjoyment went up by several notches. I particularly liked the modern and fusion Thai that brings in visually appealing, tasty and flavorful preparations, typically without too much gravy. A visit to Thailand cast another new perspective on the word ‘fresh’. I got to truly enjoy the authentic street food and restaurants in Bangkok, tasting fresh, crisp and colorful vegetables, sauces, curries and noodles, always ending it with some exotic fruits, cut and presented in the most appetizing manner. I have lived in Plano for the last seven years. It was a pleasant surprise to discover the density of restaurants and variety of cuisines available here. 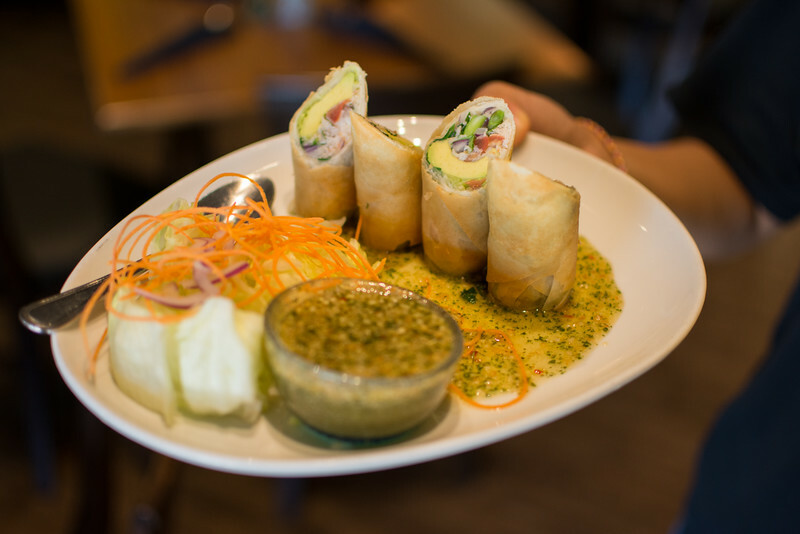 So naturally, we have tried several Thai restaurants in Plano and across Collin County. There are umpteen of them but for me, it took a while to find a handful that came close to my expectations of Thai food as in Asia Pac! Here are a few that I have enjoyed in different ways, from traditional Thai to fusion Thai. If you are new to Thai cuisine, please check out a quick primer on Vegetarian Wanderings…. Tucked away in an unnoticeable strip mall on Preston road, Oceanic Thai was a surprising delight to discover through one of my friends. The wall color and décor with the Buddhas, is very pleasing and classy. Having liked it on the first day, I actually went back the very next day with family, and it proved to be a delight again, in terms of fresh ingredients, tasty food, service and atmosphere. They make their own sauces and take pride in their organic, non GMO ingredients. Vegetarian dishes abound with appetizers, soups, salads, noodles, curries, fried rice, entrees and the chef’s specialties. With most dishes, you have the option of opting for vegetables and tofu instead of the meat. My favorite items so far have been vegetable dumplings and fresh salad rolls (in rice paper wraps) as appetizers, the avocado curry, under chef specialty, something I have never seen before in Thai, the Spicy Eggplant entrée and the Veggie Delight entrée. 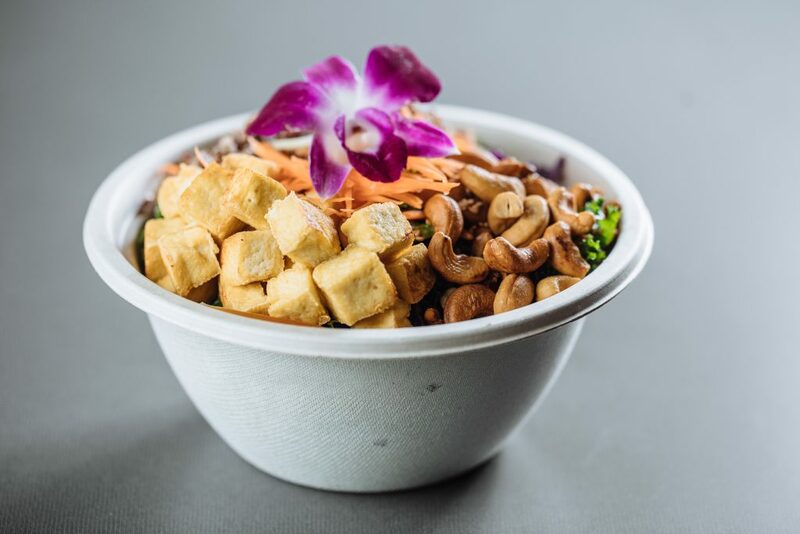 The coconut noodle bowl and the Tom Yum noodle bowl both look promising, as do the green, red and Mussaman curries and all those noodles like Pad Thai and Pad Kee Mao with different stir fried vegetables. If you are not a fan of eggs in noodles, make sure you ask before you order, and the same goes for fish sauce in certain items. They are BYOB. 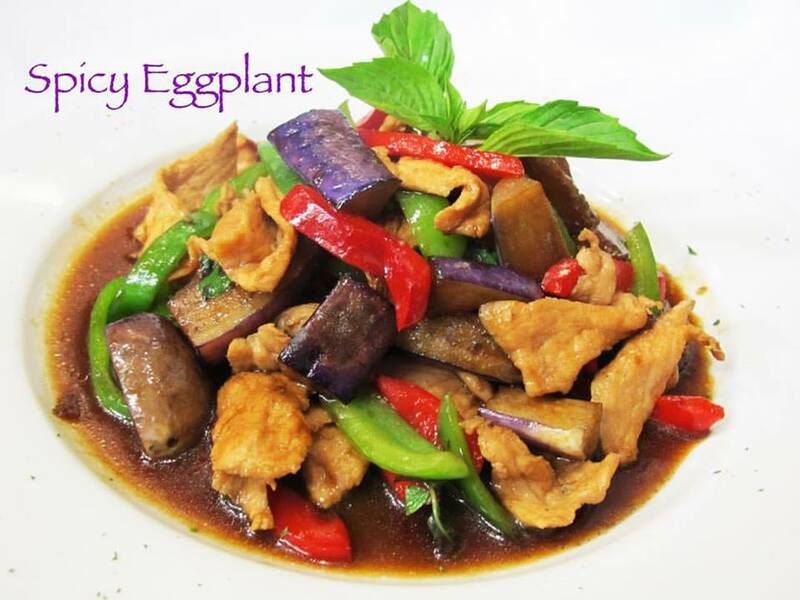 Spicy Eggplant at Oceanic Thai Kitchen. Image courtesy of Oceanic Thai. 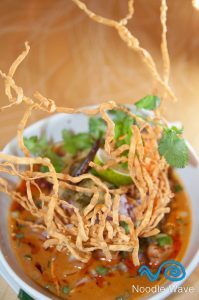 “Very different”, is what you will perhaps think as you first step into CrushcCaft Thai Eats in Frisco. Vibrant décor with exposed ceilings and distressed wood, casual atmosphere, high stools and a bar at its corner, you might catch a football game on the big TV screen. 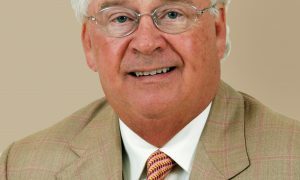 A family run business, it feels like a cross between a sit down and a fast-food restaurant. You order at the register and pick up your food in take-away bowls to eat there or take it away. Reminds one of Chipotle. The menu has many of the standard Thai items, and some rotating items that may fall into the realm of modern food. There are items where the spice level can be changed and others where it cannot (as in Green curry), so be sure to inquire. I found the Pad Ki Mao tasty and flavorful, and the Green curry very spicy for me but each person’s tolerance to spice differs. The location is perhaps good for nearby offices and businesses. I would not have known about its existence, had it not been for a google search on Thai restaurants with good reviews. The alcoholic drink names seem inspired by things Thai, such as Khing’s cup, Kohconut, Long Thailand iced tea and so on. 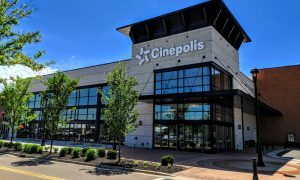 With two locations in the Collin County suburbs of Frisco and McKinney, this small chain has an additional two restaurants at Garland and Richardson. They have a dinner menu, a catering menu and a kid box menu. As with the other two restaurants mentioned above, freshness is the name of the game and we, as customers, are always glad to hear that. Noodle Wave is bright and casual with an inviting décor, nice lighting and art pieces on the wall that give it a modern flair. 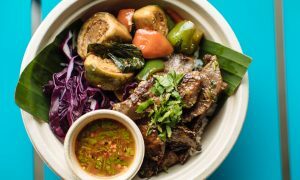 The restaurant is owned by the two chefs and they take pride in their food quality and preparation, which ranges from traditional to fusion Thai. The Tempura Asian water spinach would be something different to try as an appetizer. You will find many of the usual Thai dishes and won’t go wrong if you picked a tasty Tom Kha soup, minus the chicken or the shrimp, and a Papaya salad, for starters. As is the case with most other Thai eateries, you can ask for many of the items without the fish, meat or eggs, and replace it by tofu (or simply go with the veggies). For a change, you could try the Yellow curry or Roti curry or Southern Yellow rice curry, inspired by Indian recipes, which is unusual to see on a Thai menu. Yet another restaurant in a strip mall, a place that could go easily unnoticed if you weren’t looking for it. It has been a while since I have eaten at Mango Thai but still see largely good reviews. I remember having really liked the Cucumber and Mango salad, the Green Papaya salad, a green veggie stir-fry, the red curry and a Pad Thai (sans egg in the noodles), all well-presented. The crisp vegetables and fresh ingredients bring out the flavor of their dishes. I also have liked their Summer roll with the rice vermicelli, mango and basil and the Asparagus Basil stir-fry. They have a wide choice for vegetarians, and a full-fledged bar with a happy hour from 2 pm to 7 pm every day. The lighting, décor of Thailand and overall ambiance is very pleasing, with the wall color that would surely remind you of a mango fruit! In a fairly obscure strip mall, you will find a row of well rated restaurants, Thai, Japanese, Indian and a Sichuan hot pot, next door to a Fedex Office. Not exactly the location one has in mind for a Friday or Saturday night outing. However, the reason to go to Saucy’s Pho and Thai would be for the food. Casual, clean and a decent place to sit down and enjoy a lunch or dinner. The fresh, honest ingredients come through with every bite. The menu has mostly Thai items and some Vietnamese items and in that manner, it is different from many Thai restaurants. I really like the vegetarian Pho with its rice noodles, vegetables and broth, to which we add the crunchy bean sprouts, basil leaves, and maybe the Sriracha and Hoisin sauce. Other items to enjoy are the Spicy Basil entrée, Ginger Thai entrée, apart from the curries and noodles. It has all the usual Thai items that you may be looking for and more. The Vietnamese Bun Thit Noung, which is Vermicelli based, sounds very good and I will try its vegetarian version next time I am there with a Singha from their bar. Check out the selection of desserts too if you are into coconut, banana, sticky rice or ice cream based ones. There is a Dallas location of this restaurant too. With Plano, Frisco, McKinney and Allen having so many restaurants, writing about them should always be considered as ‘evolving’. It would be remiss not to mention a few others like Legends Thai and Ruang Thai, which have good customer ratings and I have yet to try. There is Thai Jasmine in two Plano locations where I have had some traditional Thai food. There is Samui Thai in the Shops of Legacy, always a great location to spend an evening. It has good ambiance and it might be a good place to start if you are new to Thai food and spices. As with every Thai restaurant, check the level of spice with the waiter, for each dish you order.